It’s Summer time. 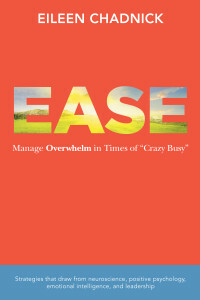 When the living is (supposed to be) easy…..
It’s the Ease Book Summer Give-away! It’s summer and the ‘livin’ is (supposed to be) easy. To celebrate the season, I’ve decided to share a bunch of content from my book, Ease, for you to read at your leisure — and get you ready for the oncoming ‘crazy busy’ season just ahead. This is “Ease-y” reading — each section (Chapter or Tool) will take about 2-3 minutes to read (max 4 for the longer ones). The whole table of contents is laid on this page — at my Ease Book website. The ‘freebies’ are hyperlinked. Available for a Limited Time – Don’t Procrastinate! I’ll be taking a few of these links (chapters/tools) down sometime after Labour Day so make sure you have a chance to dip in sooner than later. You’ll need these strategies when the busy, busy, busy season begins (September – but for many of us, it’s year-round). Feel like getting the whole book (e-book and hard copy options available). Hop onto the Buy Ease page and you are just a couple clicks away from the getting the whole shebang. But seriously – this summer give-away is packing in a whole bunch of good stuff for you to start with too. No catch – just good ease-y reading for you. Enjoy your ‘Ease-y’ reading and get ready for the busy season just up ahead (shhh, we won’t go there just yet). One more thing! From time to time, I invite my newsletter subscribers to join me in discussions, presentations, courses and more. Don’t miss out! Join my newsletter to stay in touch. You won’t be bombarded and you can unsubscribe any time!